The roads and freeways of America’s cities often become extremely congested during rush hours. As a result, the New Hampshire Department of Transportation (NHDOT) is making High Occupancy Vehicle (HOV) lanes open to use for Single Occupant Vehicles (SOVs) for a toll. 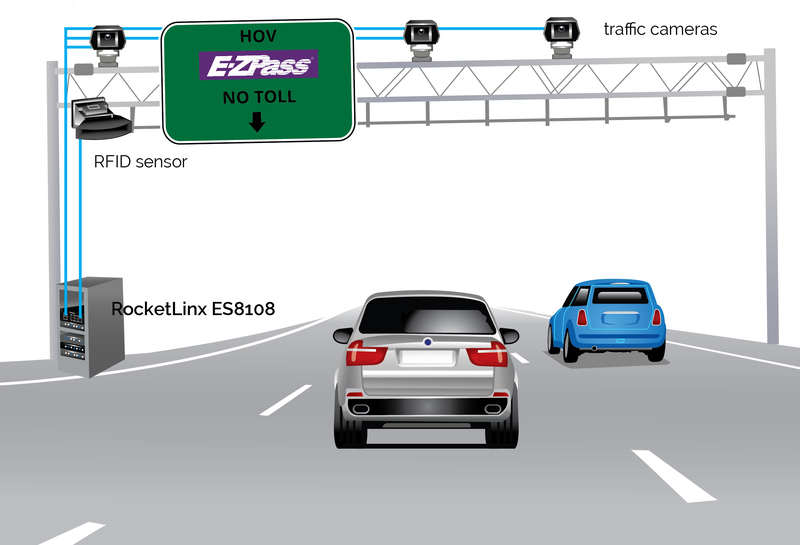 The tolling system (E-ZPass) is modeled similarly to that of the SunPass, MNPass, I-Pass, and EZ-Pass systems in Florida, Minnesota, Illinois, and Indiana. It is required that numerous sensors and other pieces of equipment have the ability to reliably communicate – for an efficient and dependable tolling experience. An experienced Electronic Toll Collection (ETC) company was hired by NHDOT to oversee the upgrading of the tolling system. Comtrol was able to provide a solution for the ETC company with the RocketLinx ES8108. The ES8108 is an unmanaged, industrial Ethernet switch, requiring no set up to allow true “plug-and-play” connectivity. The ES8108 transfers and receives data to and from connected devices. For this application, the ES8108 would maintain communication between sensors and traffic cameras in various tolling lanes. Comtrol has partnered with this ETC company in the past for transportation solutions, and the partnership experience played an important factor in choosing Comtrol again. The RocketLinx ES8108 offered the desired port density for the application, and can function in temperatures ranging from -25°C to +70°C. In addition, the ES8108 is protected by IP31 grade aluminum housing. This provides excellent heat dispersion, protects against dust and water damage, and allows for easy DIN rail installation. RocketLinx Industrial Ethernet switches are made for use in harsh environments and provide rugged connectivity solutions for industrial Ethernet networks and systems such as industrial packaging and processing, traffic intersection management and sensor data collection. Along with having IP31 grade protection for rugged, harsh environments, these switches are designed to provide dependable networking solutions.